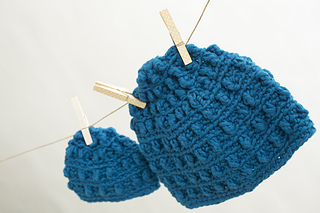 These textured beanies make great gifts for your favorite mother and her child(ren). Customize the colors to suit the personality of each recipient, or make a matching set! 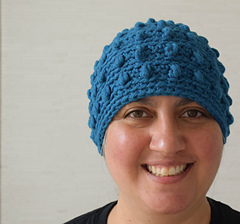 This pattern was originally published in the August, 2014 issue of I Like Crochet. Newborn (Toddler, Adult): Hat circumference 12”/30 cm (16”/41 cm, 21”/53 cm) to fit head size 14”/36 cm (18”/46 cm, 23”/58 cm). Schachenmayr original Boston (70% acrylic/30% wool, 1.75 oz/50 g, 60 yd/55 m) – 1 (2, 2) skeins 00065 Teal, or approximately 60 yd/55 m (120 yd/110 m, 120 yd/110 m) in any super bulky weight yarn. US L-11/8 mm crochet hook, or any size needed to obtain gauge. Stitch marker or waste yarn. Through Rnd 5 = 3.75” (9.5 cm) in pattern before blocking. For best fit, always check your gauge.